The Government has announced a raft of new measures designed to crack down on the use of high-powered lasers, which have endangered pilots and train drivers. 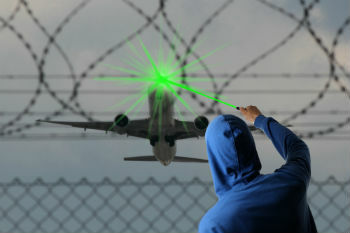 Whitehall has pledged to provide additional support to local authorities ports and borders teams to stop high-powered laser pointers entering the UK. This includes supporting local authority teams to carry out increased checks at the border, such as testing products to ensure they are safe. The support will also ensure local authority teams have access to the necessary scientific, technical and testing expertise. More than 150 incidents of eye injuries involving laser pointers have been reported since 2013. The vast majority of these incidents involved children. There have also been thousands of incidents where lasers have interfered with public transport. In 2016, the Civil Aviation Authority received reports of 1,258 laser incidents, with Heathrow the most frequent location for reports of the devices being used ‘recklessly’. Records from the British Transport Police show that between 1 April 2011 and 30 November 2017, a total of 578 laser incidents were recorded. This equates to approximately 96 incidents per year. Margot James, the consumer minister, said: ‘The Government has listened to concerns from pilots, health professionals and safety experts, which is why we are going further than ever before to crack down on the sale of unsafe devices. These new measures build on the Laser Misuse (Vehicles) Bill. Introduced by the Department for Transport last year, the Bill expands the list of vehicles it is an offence to target with lasers. It also makes it easier to prosecute offenders by removing the need to prove an intention to endanger a vehicle. People who shine laser devices at transport operators could be jailed for up to five years.